BABIP – Batting Average On Balls In Play: just as the name says, the batting average of non-strikeouts & non-home run at-bats. This generally normalizes around .300, but a pitcher can set his own a bit off of that norm one way or another depending on his tendency toward inducing contact that results in groundballs or flyball. A pitcher can enjoy an abnormally low BABIP for an entire season, but guessing who will be the fortunate one(s) of a given season is a risky proposition thus the smart money is on the Regression Monster’s appetite. LOB% – Left On Base Percentage: the percentage of base runners left on base, duh. This generally drifts toward 72% as a league average, but some pitchers buckle down with runners on helping them sustain a higher mark and others crumble at the first sign of danger leaving them below the average for a season (or career, right Dave Bush?). Some are just plain lucky or unlucky here within a season, too. HR/FB – Home Runs per Flyball Rate: the percentage of flyballs allowed by a pitcher that leave the yard. The average here 10% regardless of flyball count allowed so if a flyball pitcher will naturally yield more home runs, on average, than a groundball pitcher because their 10% portion comes from a larger pie. Pretty simple stuff. Some guys can have some good fortune that carries them through a season, but again betting on who will remain fortunate for the six month season is a fool’s errand and as such an abnormally low figure is expected to encounter regression as the season wears on and the weather heats up. When the Regression Monster sees a pitcher with an ERA and WHIP that belie his skill, he notices that it is often fueled by some good fortune in one or more of the above figures. Thus he makes plans to visit that pitcher to either nibble on or gorge himself on their ERA and WHIP while in the process evening out some of that previously experienced good fortune. Sometimes, just as with a rock band touring, the Regression Monster will have more than one stop in a particular city either to visit a pitcher for a second or third time or to indulge with another pitcher on the ballclub. I now present you to the RMST2K11. May 10th – Clayton Richard (SD) – Carried a 3.55 ERA in early May despite a weak 1.5 K/BB. The main culprit was a 4.2% HR/FB that was not only well below average, but also tempting fate because he was allowing flyballs at a 1.3-to-1 clip against groundballs. Regression Monster started his tour with a bang catching up with Richard in Milwaukee where he allowed eight runs, seven earned in just three and a third innings pushing his ERA to 4.79 on the year. Richard has been inviting RM back for a second showing by posting a 3.22 ERA over his last 36 innings despite a pathetic 18/14 K/BB (1.3) and some continued undeserved good fortune in his BABIP (.260) and HR/FB (5%) despite a shift to more groundballs than flyballs (1.1 GB/FB). May 27th, June 1st, June 6th, June 12th – Josh Tomlin (CLE) – The Woodstock of the Regression Monster tour, Tomlin’s correction was a two week-plus festival. Tomlin, who apparently moonlights as a magician, managed not only to get a BABIP below his weight (.175 against 190 lbs. ), but also had perfected the seemingly impossible art of allowing solo home runs. Through May 21st he had allowed eight home runs on the year, but was fortunate enough to have the bases empty for seven of them. He thought he was off the Regression Monster’s radar with a 7% HR/FB rate which is below average, but not wildly so. Alas, the Regression Monster is thorough. He not only saw the minuscule BABIP, but also the abundance of solo shots so he packed his bags for what he knew would be an extended trip. He first met Josh in Tampa and managed to attack two birds with one stone as Tomlin allowed 10 hits in six innings and gave up a pair of two runs home runs. But it was merely the beginning. Over the first 12 days of June, the Regression Monster put together a string of hits that no will no doubt become classics on his discography. In that span Tomlin allowed 18 runs (exactly six per outing) in 17 innings good for a 9.53 ERA while yielding a BABIP of .438 (and .424 across all four outings). Of course that might not be the last Tomlin sees of RM as his HR/FB during their time together was 6% meaning another visit could come shortly to push that 4.14 ERA even higher. May 29th & June 3rd – Zach Britton (BAL) – This rookie has nasty stuff, there is no doubting that, but he is still learning how to use it in his debut season. He gets a lot fewer strikeouts than you would expect (5.2 K/9 for the year) which he offsets with a massive groundball slant (54%), but still with that filth you would expect more missed bats. He used fanciful BABIP (.242) and LOB% rates (80%) to mask his underwhelming 1.6 K/BB and take a 2.35 ERA into his May 29th start at Oakland. Little did he know that the Regression Monster was in the house that night and before he knew it he had given up six runs on 10 hits and three walks while striking out three in five and two-thirds innings. Unhappy with his effort, the Regression Monster followed Britton back to Baltimore for his next start and aided Britton in yielding seven runs, five earned, on six hits and three walks while again fanning three. Britton came out of the two-start ordeal with an ERA nearly a full run higher at 3.33. May 30th, June 5th, June 12th – Wade Davis (TB) – The RM was busy early in May, but he sent some minions to check in on Davis who made it through April and his first May start having allowed just one home run on 84 flyballs allowed (1.2%) en route to a 2.77 ERA. Further exacerbating things were 3.9 K/9 and 1.2 K/BB rates. In other words, he has no business with such a sparkling ERA. The minions chiseled away at the ERA pushing it to 3.71 before their fearless leader stepped in. The Regression Monster started a three date avalanche of fun with Davis spanning three cities (Tampa Bay, Seattle and Baltimore) during which Davis allowed 16 runs in 15.7 innings (9.19 ERA) thanks in part to four home runs allowed (out of 40 flyballs, 10%!). The three stop bender with the Monster has left Davis bruised & battered and on waiver wires across the nation. He may have to undergo some bullpen therapy or check into the rehab clinic in Durham. May 30th – Kyle McClellan (STL) – The beauty of the Regression Monster is that his private jet allows him to get from place to place, even same day, with ease. Sometimes he can be a little rough, though. Sure, McClellan didn’t necessarily deserve his ill begotten 3.11 ERA thanks to a meager .250 BABIP and fully unsupported by a paltry 4.5 K/9 and 1.8 K/BB, but the Regression Monster probably went too far. He munched on McClellan’s ERA so furiously, leaving it at 3.86 after a 7-run, 4 inning outing, but he also rendered him infirm resulting a stint on the disabled list. June 4th, June 9th, June 15th – Trevor Cahill (OAK) – Sometimes the Regression Monster is overbooked for a summer and the tour doesn’t reach a more than worthy destination. Such was the case with Cahill in 2010. Cahill had a fantastic season on the surface with a 2.97 ERA, but he didn’t rest easy over the bulk of the summer. He often slept with one eye open knowing he could soon be visited by a pitcher’s worst enemy: the Regression Monster. By season’s end, Cahill had a 1.9 K/BB rate, .236 BABIP and 77% LOB% which all suggested that his ERA should’ve been much closer to 4.00 than sub-3.00. Cahill decided to tempt fate again thinking that raising his strikeout rate from 5.4 to 6.7 K/9 would remove him from the scrutiny of the RM, yet he was still too brash almost rubbing another sub-2.0 K/BB rate in the RM’s face which then drew attention to his raised but still below average .263 BABIP. Remember the jet we discussed earlier? Well that’s new in the Regression Monster’s transportation fleet, upgrading from an exquisite tour bus, and it allows him to book many more gigs throughout the season and he had Cahill in the crosshairs. Over his last three starts, Cahill has seen his BABIP skyrocket to .375 along with a sub-1.0 K/BB rate that resulted in 15 runs allowed in 14 innings (9.64 ERA) and a 2.21 WHIP which almost matched his 2.31 ERA prior to the tour dates. Remember, Regression Monster sees all. It’s not a matter of if but when. June 6th & June 12th – Tyler Chatwood (LAA) – These tour stops were booked in advanced or else the Regression Monster would have definitely fit LA into his schedule sooner. Chatwood practically begged for a visit by toting a 0.72 K/BB rate in his first 42 innings yet still felt entitled to a 3.67 ERA with it. It took some finagling, but RM hastily prepared a trip to Oakland after which he thought an understanding had been reached. Chatwood was pasted for seven runs, five earned, in two and third innings. He responded by striking out six and walking two in his next start so the RM thought everything registered despite such a quick visit. But some only learn the hard way and Chatwood struck out four while walking five in his next two starts spanning 13 innings yet had the audacity to compile a 2.03 ERA in the process, but the already-scheduled tour dates were on the horizon and the week-long event was a doozy. Chatwood was torched for nine runs in 10.7 innings (7.59 ERA) along with a .406 BABIP. Not even his 10:4 strikeout-to-walk rate could save him. Now his season ERA sits at 4.20 and he is now gainfully employed on your local waiver wire. Various stops (Correia) & June 12th – Kevin Correia/Charlie Morton (PIT) – Sometimes you play a city so many times it feels like home and over the past 15 years or so the Regression Monster has essentially lived in Pittsburgh so while he knew the lay of the land well, it was almost a bittersweet return as he nearly let his emotions get the best of him and prevent him from doing his job. Still he knew what he had to do. The Regression Monster has played some smaller venues with these Pirates instead of opting for an extended festival-like stay. A stop a month with Correia is all the RM has been able to fit in as he is torn between letting the success continue and fulfilling his duties as the Regression Monster. That said, Correia’s ledger is evened up after the handful of quick visits now has his ERA at 3.73 and a FIP only slightly higher as his modest BABIP and HR/FB luck are counterbalanced by a below average LOB%. With Morton, the Regression Monster has continually rescheduled the tour date due in large part to his co-worker’s, the Regression Goddess, malfeasance throughout all of 2010. The Regression Goddess, as you might have guessed, has her own tour throughout the year whereby she essentially does the opposite of the Regression Monster by identifying those being unfairly punished abnormal BABIP, LOB% and HR/FB rates that leaves their ERA and WHIP mangled despite skills and talent to the contrary. She let Morton rot on her watch as he had a .353 BABIP, 53% LOB and 18% HR/FB in 80 major league innings leaving him with a 7.57 ERA and 1.73 WHIP. As of this writing, he has yet to accept to her multiple apologies. She was suspended without pay late last year while an investigation into the matter took place as there was a rumored past romance between Morton and the Goddess. The findings were inconclusive. The two have spent an inordinate amount of time together this year perhaps reigniting the flame of a past love and Morton has shaved nearly four and a half runs off of his ERA thanks in large part to an absurd groundball rate of 64%, but also a career-best in LOB% (75%) and HR/FB (4.7%). Despite the amazing groundball-inducing ability, the 1.3 K/BB, thanks to a sub-5.0 K/9, the Regression Monster was handcuffed and instructed by his boss, the Luck Dragon, to remedy the matter. And his June 10th visit added more than a half run to Morton’s ERA taking it to the 3.08 mark from 2.52 after six runs in four innings with just a single walk and strikeout. 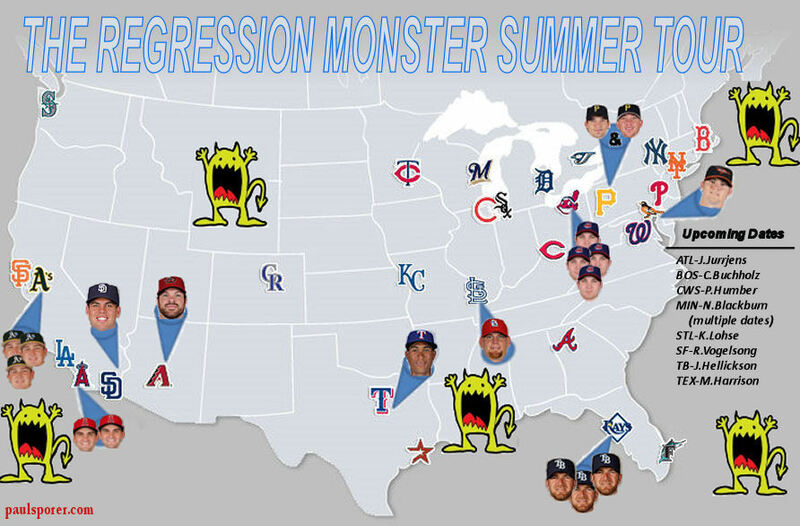 Message boards are abuzz with rumors of another Pittsburgh stop for the Regression Monster at some point this summer. June 14th – Alexi Ogando (TEX) – It is hard to blame Ogando for this RM tour stop. As a reliever, he is used to a wild west mentality when it comes to BABIP, LOB and HR/FB. Basically anything goes in the small sample size arenas they inhabit. This is what happens when you don’t read your syllabus in Starting Pitching 101. The Regression Monster held out as long as he could, but a .210 BABIP and LOB% well over 80% was just too much, especially with an outing against the Yankees on tap. The RM had a blowout bash for Ogando and the results were six runs in just 1.7 innings adding .61 to his ERA and 0.06 to WHIP keeping both at still magnificent 2.71 and 0.96 figures. There are a few more Regression Monster stops being planned in the Arlington area later this summer. June 14th – Josh Collmenter (ARI) – No way the old tour bus makes it from New York (where Ogando was) to Phoenix in one evening making the jet a godsend. Phoenix wasn’t in the pre-tour plans, but the emergence of Collmenter made it a must-stop and as soon as possible. I don’t know what it is about Joshes, but they bring out the best in the Regression Monster. You’ll remember Tomlin was toting a .175 BABIP before the Cleveland Bonanza and apparently Collmenter didn’t catch on with the exact same figure, but perhaps he thought he could outsmart the RM by starting the season in the bullpen. Again, the Regression Monster knows ALL. And he certainly didn’t appreciate Collmenter pushing his BABIP down to .167 as a start with meager 5.0 K/9 resulting in a 1.05 ERA in 34 innings. The Regression Monster started would could be a series of events in Arizona the first of which saw Collmenter allow five runs in five innings allowing eight hits, walking three and striking out four. The season ERA is now 1.86, but his FIP is nearly a run and a half higher and his xFIP is almost two runs higher so follow the Regression Monster tour updates on Twitter for more details about upcoming Seattle stops. The Regression Monster: Coming to a Stadium Near You! Add Matt Joyce to Tampa… 5 for his last 42 although he is battling a shoulder problem.